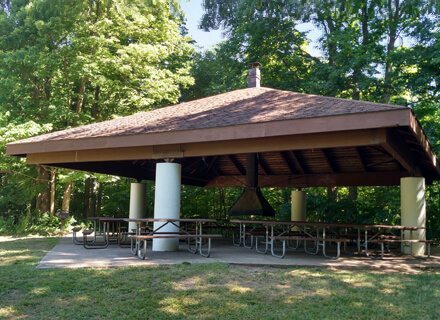 Located at the heart of the park, Black Maple is an open-air shelter with easy access to a number of recreational amenities. The spillway and fishing pier are just across the road providing excellent fishing opportunities. Nearby trails lead through woods and connects to a wooded boardwalk over a wetland habitat. A short walk will take you to the disc golf course, playground, athletic field, and volleyball court. Shelter includes a campfire pit. From the gatehouse, take the first left and continue for a half-mile. After crossing the covered bridge look for signs for the shelter on the right.